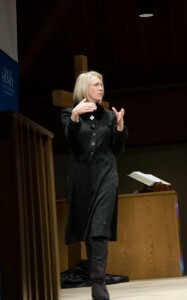 Dr. Cherith Fee Nordling of Northern Seminary joined the Trinity community this past week to deliver the latest Scripture & Ministry lecture entitled “Reconciling all things to God in Christ: The Cruciform Call to Glory.” Her lecture was a part of the Henry Center’s ongoing theme of The Church and Reconciliation. Noting the timeliness of the theme of reconciliation in a year marked by rising racial, social, and political tensions, Dr. Nordling shared a number of helpful correctives in the church’s understanding of reconciliation. Just as the person of Christ cannot be separated from his work, so reconciliation cannot be separated from the reconciler. Jesus is the reconciler who reconciles us along with all things to God. As the ultimate Priest who sacrifices himself on our behalf, he brings us who were once “far off” and restores us to God. As we as the church are united to Christ, we continue his work of reconciliation by his Spirit, and to speak of reconciliation apart from the life of Christ is impossible. When we separate reconciliation from reconciler, we are prone to two eschatological mistakes. The first is an under-realized eschatology, where reconciliation is privatized and spiritualized and an inordinate amount of attention is given to eternal salvation at the expense of any present experiences of future glory. The other is an over-realized eschatology, where concepts like social justice, equality, and fairness reign while minimizing our sin and separation from God. The broken experience of North American white privilege blinds many from seeing the systemic walls of hostility and the need for prophetically breaking down barriers. We are also trained by our evangelical culture to adopt a form of dualism whereby the material is separated from the spiritual and the world from heaven. Finally, we are tempted to extract reconciliation from the reconciler, losing our ability to hear prophetically from the Spirit of God who communicates to us the life of Christ. The “already and not yet” eschatological framework should guide our understanding of reconciliation. We are called to suffer with and for others, just as Christ suffered on our behalf. Yet we are also called to a glory, practicing our future destinies in the present and bringing forth healing now. This is how we have and live the “mind of Christ” by the Spirit as we challenge the existing narratives of this world. Throughout the lecture, Dr. Nordling’s twofold concern for the church and for the Triune God who created and sustains that church resounded. Through her autobiographical accounts and dogmatic convictions, Dr. Nordling gave an empassioned plea for perseverance in the task ahead as we await and anticipate the future day of glory.